The Vienna Aktion Group formed the most provocative, insurgent and challenging of all the worldwide art movements of the 1960s. Their sexually-charged and anti-social actions exacted a profound and irreparable upheaval in the way in which art was conceived. Using their own bodies as raw material, the Aktion Group undertook experiments in cruelty that disassembled the human body and its acts into compacted gestures of blood, meat and excreta. 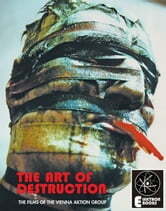 The films of the Vienna Aktion Group - made both by the group themselves, and by collaborators such as Kurt Kren - form the essential residue, debris and evidence of their performances. Film forms the sensitized medium - as unique and ferocious in its impact as the corporeal material upon which the Aktion Group worked - that allied itself most intimately to their experiments. For the first time, this book focuses on those films as fully revealing the obsessions, ambitions and outrages of the Aktion Group. The iconoclastic work of the Vienna Aktion Group is now more contemporary than ever before, and THE ART OF DESTRUCTION provides a comprehensive introduction to that work in both film and performance. Fully illustrated and annotated, this is a book of compelling interest to all students of film, art and performance, and for all readers engaged with questioning social and corporate cultures.